Windows 7 users can rest comfortably until at least January 2015. That’s when “mainstream” support of the OS will end, according to Microsoft. Until then, you will continue to receive both security and non-security updates (product enhancements and non-security bug fixes). If your license came with free incident support, you will get it. But on January 13, 2015, support for Windows 7 will be scaled back. You’ll still get free security-related updates, but other types of support will be available only by subscription. You will have until April 15, 2015, to buy a subscription for this “extended support.” Warranty claims will not be honored and you will not get new features, only bug fixes. All support for Windows 7 will end in early 2020, according to Microsoft’s product life-cycle policy. After that, you will receive no security patches and money won’t buy any other support. By then, you’ll need a plan to migrate to a newer version of Windows, Mac, Linux, or whatever else is available in 2020. Windows XP is much closer to becoming an orphan. XP has been in the Extended Support phase since April 14, 2009, and all support will end on April 18, 2014. (Extended support for Vista will end in April 2017.) If you are running XP, you should start planning a migration to Windows 7 or Windows 8 real soon now. It isn’t a trivial task, especially for business users. User data and settings will transfer to a newer operating system fairly easily. But all application software will have to be re-installed. That means you may have to track down CDs, DVDs, downloaded installation files, and license keys. 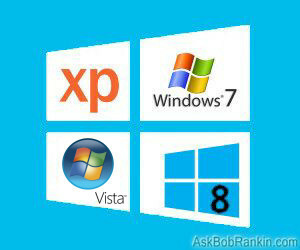 Some applications written for XP will be incompatible with Windows 7 or 8, wholly or in part. You should identify incompatible apps well ahead of time and find alternatives. Clinging to an orphaned operating system is a foolish and dangerous option, not unlike driving on bald tires or an empty oil reservoir. Malware writers and hackers will increase their targeting of orphaned operating systems and you will receive no defensive patches. Some sort of disaster is virtually guaranteed. Bob Rankin Windows 7, Windows XP. permalink. I am happy with my windows XP. I am on disability and can't afford windows 7. Isn't there anything else I can do? Please help me. IDEA !! If you have special programs such as the music match program which won't run on windows 7 or later, consider getting another computer to install the new operating systems on and keep your old windows XP computer and never again hook up to the outside world (internet) with the old XP computer. I disagree. Some applications can be reinstalled but some can not. And who is to tell me that I give up a week of my life re-installing programs that work fine. Consider buying a dedicated security device that is between my XP and the world, and provides pretty complete protection. Maybe I will have other computers for other projects, but I won't be giving up XP just because microsoft things I should spend more money on them. By all means buy the latest MS abuse to stay current. The author presumes that buying a product from that evil company is the way forward for anyone using XP. He wants to scare you into buying new MS product. MS is dying and you do not need to remain their slave. XP is needed for legacy hardware and software, since much will not work with Windows 7 or 8, even with emulation. For daily work use Linux. You can freely download a distribution which will give you a current OS. No cost, no MS aggression and aggravation. WinXP will actually die out when anti-malware programs no longer cover it and drivers for newer hardware don’t exist. As for me, I’m moving to Linux. I would like to add on to some of the points that Mr. Rankin makes in his article, specifically those about Windows XP. Many users don’t seem to understand what it means with the Windows XP extended support period ending on April 8, 2014. Microsoft has put some resources in place to help understand what that means and what can be done. The biggest thing that users need to know about Windows XP is that after the end of support date, there will no longer be any new security updates or non-security hotfixes. Aside from that, other support options will no longer be available. One page that can give more information on this can be found here on the Windows XP End of Support page. In order to stay with a current operating system, users will want to take advantage of being able to migrate to Windows 7 or Windows 8. A good place to start would be with this blog post which outlines many tools that can make your migration easier, thus ensuring many more years of support. Another great resource for IT professionals is the Springboard Series on TechNet which can helpful for finding information regarding operating systems migrations and also managing those environments. Extended support for Vista will end in April 2017.